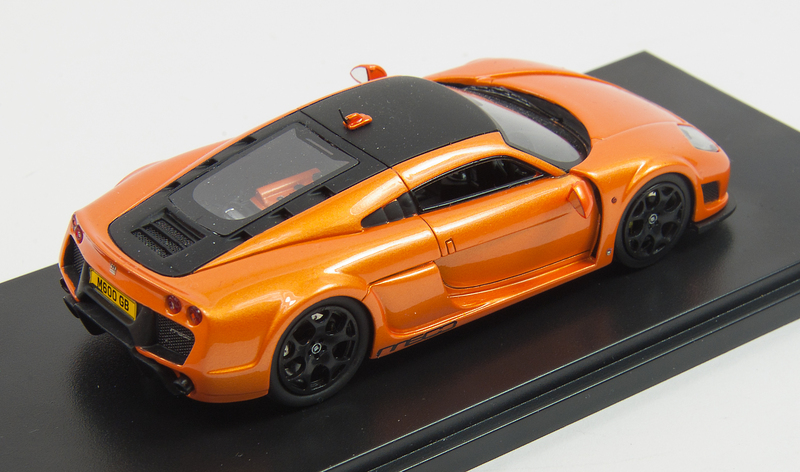 Several hand-build models ensued and the M12 GTO -3R sold 1,500 units before the Noble M600 was launched in 2011. The car is still in production and according to various publications and TV shows, is faster than a McLaren F1 supercar, assuring its place among the monied class that can afford such hot wheels. 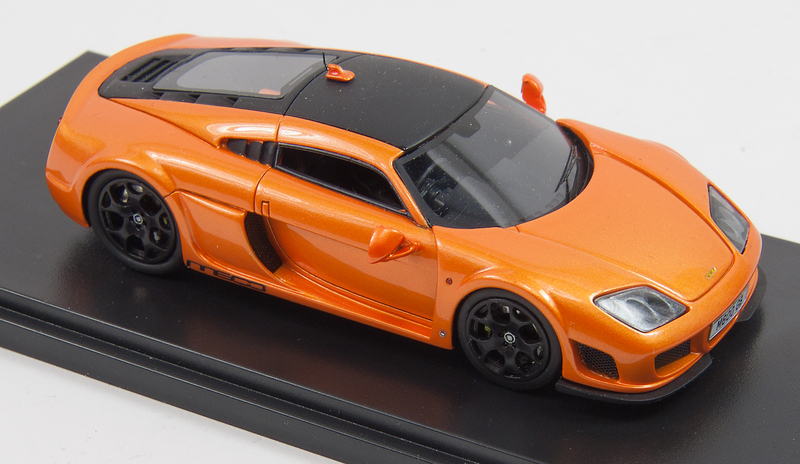 The M600 features a Volvo twin-turbo V8, known as the B8444S, to create its massive horsepower. The engine was developed for Volvo while Ford owned the firm. The engine itself reportedly was designed in Sweden and built by Yamaha in Japan. Horsepower is variable, from a low of “just” 450 horses for the road version to 550 horses in “track” mode and 650 horses in “race” mode. In any case, it’ll move, reportedly doing 0-60 mph in 3.0 seconds and 0-100 in 6.5 seconds. Top speed is 215+, depending on how long a straight road you have at your disposal. Not surprisingly, the Noble has the profile of a supercar, rounded, low and slick as a greased arrow. You can see Ferrari, McLaren and Lamborghini in its lines. 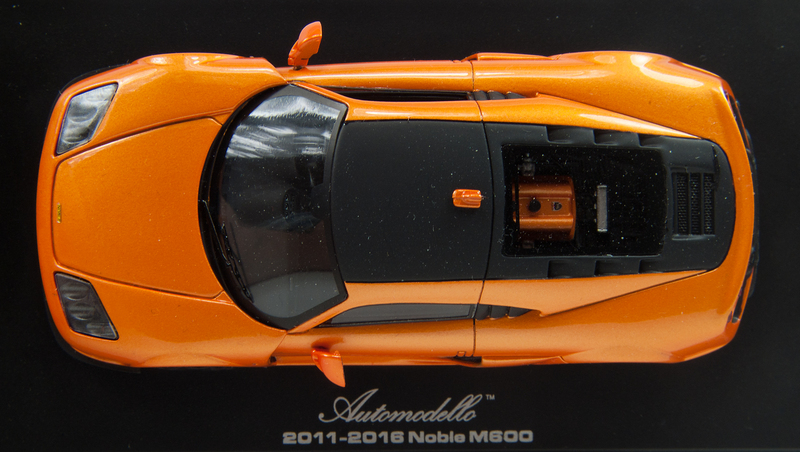 Automodello provided us a sample of the Midas Orange Demonstrator, one of 299 pieces, and the paint scheme is deep, rich and full of sparkle, reminding me most of some of the fabulous Lamborghini paint jobs. As with other models from Automodello, the cast resin Noble’s body is flawlessly executed and ripe with crisp detail lines. Creases that define the hood, doors, side air scoops and even tinier things like the door handle outlines are perfect. The nose features photo-etched screens on vents below the flush projector-beam light lenses and screens too on vents just ahead of the front wheel wells. Similar screens frame the rear license plate on the tail, just below the twin circular rear lights that are reminiscent of recent Ferraris. Noble’s roof is flat black and extends to frame the rear-mounted engine’s windowed bonnet. A screened vent rests below that rear window and you can see the orange, black and silver engine through its glass. There are big aerodynamic side mirrors with mirrored lenses and more black mesh in the vents right behind the doors. Tires are treaded, but not branded, and feature handsome black sport wheels with monstrous silver brake rotors backing them. Inside is a well finished interior although it’s a bit tough to see due to the car’s thin side windows. Still, you can make out the sport wheel and center console, large floor-mounted shift lever and through the windshield you can make out the black bucket seats. As with all Automodello models, the Noble comes in a sleek acrylic case with black base including the car’s name engraved in the base. 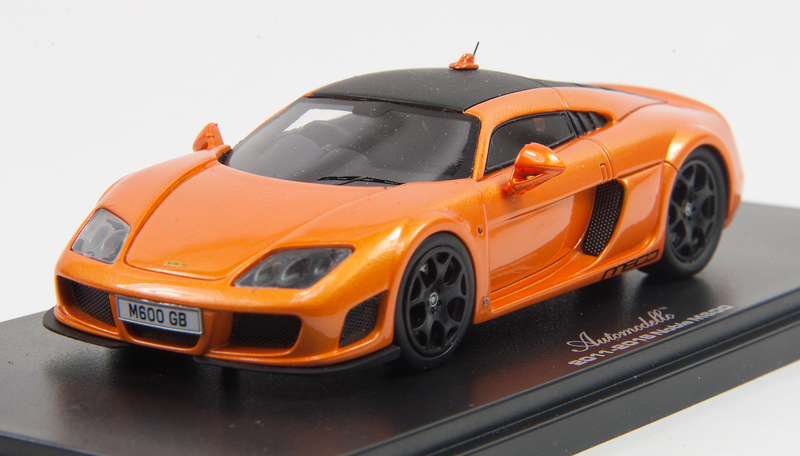 If you’ve been waiting for a high-quality Noble model to round out your British supercar collection, the wait is over. Note too that a Carbon Sport black model with red engine, interior and wheels is available, along with a baby blue model representing the car’s prototype. All list at $119.95 each.